Modern drivers are skilled at anticipating and reacting to the behavior of nearby vehicles and the environment in order to travel to their destination safely. Nevertheless, all drivers operate with an information gap - a level of uncertainty that limits vehicle energy efficiency. For instance, safe driving demands that drivers leave appropriate space between vehicles and cautiously approach intersections, because one can never fully know the intentions of nearby vehicles or yet unseen traffic conditions. Closing this information gap can enable vehicles to operate in more energy efficient ways. The increased development of connected and automated vehicle systems, currently used mostly for safety and driver convenience, presents new opportunities to improve the energy efficiency of individual vehicles. 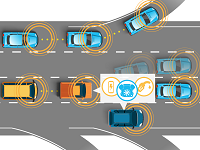 Onboard sensing and external connectivity using Vehicle-to-Vehicle (V2V), Vehicle-to-Infrastructure (V2I) and Vehicle-to-Everything (V2X) technologies will allow a future vehicle to "know" its future operating environment with some degree of certainty, greatly narrowing previous information gaps. By providing the ability to predict future driving conditions, these technologies could operate the vehicle powertrain (including the engine, transmission, and other components) more intelligently, generating significant vehicle energy savings. If successful, this UC Riverside project will enable at least an additional 20% reduction in energy consumption of plug-in hybrid buses. These innovations could lead to more efficient domestic buses and eventually other transit vehicles, lessening U.S. dependence on imported oil.